Cappuccino…Espresso…Latte… forget what you’ve seen in Starbucks and Costa. 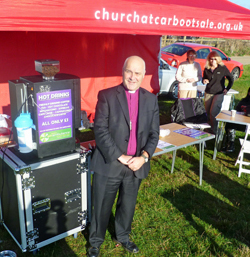 For the last few months churches in Chelmsford, Essex have been running a fresh expression of coffee shop - boot sale style! A trendily decorated café it is not, but it is an opportunity to share and enjoy quality coffee and company and you get served with a smile. 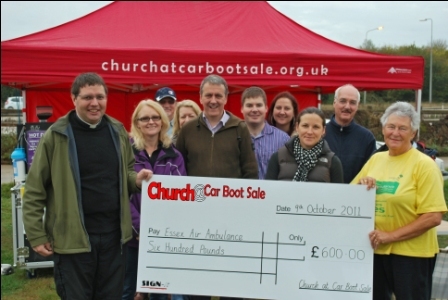 The ‘Church at Car Boot Sale’ tent opened at Boreham Boot Sale in May 2011 and is the collaborated efforts of a group of Chelmsford churches. It aims to establish positive links between the Church and the wider community and proves that Church is not a thing of the past but very much a relevant part of today. As well as prov iding an accessible church presence in a popular public place, ‘Church at Car Boot Sale’ has also been doing its bit for charity in the form of supporting the Essex Air Ambulance. A grand total of £600 was raised this season through the sale of tea and coffee. This sum was presented to a member of the Air Ambulance team on the final Sunday of the season. The popular Boreham Boot Sale has run for 15 years and is visited by hundreds of keen punters every Sunday. Were the regular buyers and sellers likely to give up their boot sale dedication to attend a church service? Not likely. So the church decided to become a regular boot sale attendee itself. The ‘Church at Car Boot Sale’ doesn't push Christianity on anyone but the dedicated and friendly team of local Christians provide opportunities to chat, laugh and get to know new people who are out hunting a bargain or selling their wares. The Bishop of Chelmsford himself even made an appearance during the height of summer and had only positive comments to make while being interviewed on site by BBC Essex Radio. "Whether church attendance is enhanced by this project matters not. The ultimate purpose in all of this is to know Jesus as a much needed Saviour and friend and make Him known to others. Jesus didn’t only hang out in holy huddles." So, world, here comes the church…and a blooming good cup of coffee!